SMS marketing is an amazing marketing tool that can truly be utilized by anyone in any given industry. Just about any kind of business can implement SMS into their marketing strategies in order to yield unbeatable results. Retail stores, bars, salons, restaurants, and even churches can all use SMS marketing in their own unique ways in order to generate the kind of buzz they are looking for in the long run. 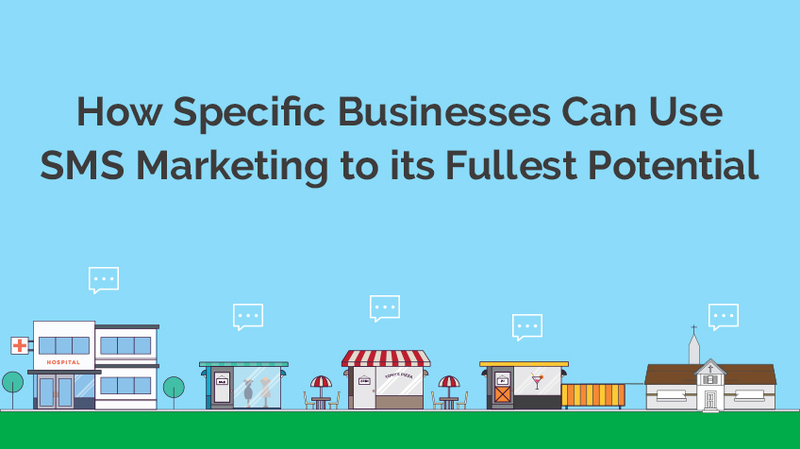 Here are a few ways that specific business can use SMS marketing to its fullest potential. The biggest thing that retail stores utilize SMS marketing for is to alert their clientele about promotions and sales. Not only can you use SMS to alert people about sales and promotions, but you can even take it one step further and use our mobile coupons feature in order to virtualize special offers and deals. SMS is a tool that can be utilized by any and all retail stores in order to not only acquire new customers, but to retain customers who come in on a regular basis as well. Reminding your customers that your store exists is something that any business owner can do through SMS easily and effectively. Whether it be a text about a sale or even about the weather, sending a text to your clients will get them through your door more effectively than any other advertising tactic. The best thing that restaurants can use SMS for is to notify their customers of specials they are running on a daily basis. We have previously discussed the reality that text messages reach audiences at a far higher rate than e-mails or social media posts do. The thing to focus on in terms of SMS marketing for restaurants is that it serves as a true and pure compliment to any other marketing attempts made by any establishments. A great way to use SMS marketing for restaurants is also to set up a loyalty program for customers. As we have explained before, loyalty programs provide customers with the incentive they need in order to become returning clients. Simply put, SMS messages will remind them to keep coming back for more which will then, in turn, put more money in any business’s pocket. SMS marketing can increase foot traffic on slow days for any place of business including businesses within the food-service industry. Similarly to restaurants, bars and nightclubs require the same caliber of marketing in order to convert one-time customers into long-time customers. One of the biggest advantages that SMS has to offer for bars and nightclubs is the idea that one can remind their customers to keep returning to their place of business. Another great tool that bars and nightclubs can utilize in order to gain more business is our text to win feature. In terms of religion, there are many entities that can utilize SMS to its fullest potential. On top of that, MMS allows houses of worship to send more inspirational content to their members through a faster medium. Churches can film their mass and sermons and then blast them out to all of their members so that even the people who didn’t attend can get inspired. Appointment reminders is a great tool that can be utilized through SMS for any kind of doctor or physician in order to efficiently keep track of their patients. Doctors, dentists, therapists, and many more places of business that function through appointments can keep track of their patients efficiently through our appointment reminder tool. The best part about using SMS in order to get in touch with patients is that the reach is beyond compare in terms of email. On top of that, sending an automatic text message saves a lot of time when compared to having a secretary or assistant make a phone call in order to confirm appointments with each and every patient. One of the best ways to get customers to come back to your place of business again and again is to create and run an SMS powered loyalty program. To take that concept a step further, we have created an amazing and more convenient way to opt in new and loyal customers so you can keep them as regular clients: our kiosk builder. Through our kiosk builder tool, you can set up an entire program right from your own tablet and establish a much higher level of loyalty between you and your customers. Salons can utilize this by collecting as many opt ins as they can and then blasting out specials and coupons to get more foot traffic. They can even create a loyalty program through the kiosk as well.